There’s more than one big appellate case being heard today. The Texas voter identification law will make a stop at a federal appeals court in New Orleans on Tuesday on a likely path to the U.S. Supreme Court. Texas Solicitor General Scott Keller and lawyers representing plaintiffs, including the U.S. Justice Department, will present arguments to a three-judge panel, with a ruling to come later. The Texas case, one of several legal challenges of state voter ID laws, is unique because a judge found evidence of intentional racial discrimination by legislators in crafting the law, said Richard Hasen, a law professor at the University of California, Irvine, and an expert in election law. Two plaintiffs’ lawyers will participate in the oral arguments: Erin Flynn with the U.S. Justice Department, and Chad Dunn, who is representing the lead plaintiffs in the Texas case — U.S. Rep. Marc Veasey, D-Fort Worth, and the League of United Latin American Citizens. Dunn said he intends to show the judges the “overwhelming evidence against this law” and how it compels them to reach the same conclusion as Ramos. “It’s not that Texas can’t adopt an identification law for voting, it’s that the individual decisions made with this law make it unconstitutional,” Dunn said, noting the narrow list of valid IDs needed to vote. The three-judge panel set to hear arguments on the Texas voter ID case includes two Democratic appointees. On the panel: Chief Judge Carl Stewart, appointed by President Bill Clinton; Judge Catharina Haynes, appointed by President George W. Bush; and Judge Nannette Brown, appointed by President Barack Obama. Who knew such a thing was even possible? The panel’s decision can still be appealed to the full court, and then to SCOTUS, so let’s not get ahead of ourselves. There are other lawsuits against state voter ID laws, but this one is farther along than they are, and would be first in line at SCOTUS when it comes to that. I’m very eager to see what these judges make of the appeals. The Brennan Center has a three part series on people who were directly affected by the enforcement of voter ID last November, and the Huffington Post and Texas Election Law Blog have more. UPDATE: Here’s the Trib story, which reminds us that putting Texas back under the auspices of preclearance is also at stake. So what will the Justice Department do with voter ID now? I hope this obscenely and blatantly partisan driven law is struck down. Clearly, the law is disenfranchising voters. Over 97% of voters clearly were disenfranchised because they could not produce a driver’s license, state ID card, or the voting card. If the law was really onerous, we wouldn’t have the amount of traffic congestion I see daily. How are all these people driving if they don’t have a driver’s license? Time to take off the tin hat Mr Daniels. I think if we took off our partisan hats for a minute, we might agree on two things. First, the problem of voter fraud is probably much smaller than Pubs would have you believe. Look at the stats from the election in San Antonio referenced. Hardly anybody votes once. How many people are going to vote multiple times when most folks can’t be bothered to cast their one legitimate vote. Now the other thing: the problem of having somebody show a picture ID when voting is probably much smaller than the Dems would have you believe. If people are dirt poor and living on the margins, chances are good they are signed up for all the freebies they can get, and in order to collect on those freebies, they have to be able to identify themselves….with a state issued photo ID. Personally I look at this issue just like I look at states trying to regulate food stamps to keep people from buying steak and lobster on the public dime. Is that really a problem? Probably not to a great extent, so passing laws to solve a problem that may not exist isn’t really hurting anyone. Likewise, I don’t see the photo ID law hurting anyone. With both issues, advocates left no stone unturned trying to find people who fit the scenarios, and if I recall, there were only about 200 of those election certificate id’s issued for the whole state of Texas. Hardly what I would call an attempted wholesale disenfranchisement of poor people. Bill have you ever been poor? You make assumptions based on what? I have stayed in houses where the floor was the ground and the people there swept the floor every day. They would also sweep the street in front of their house. My grandparents were migrant workers, my maternal grandfather would not take a penny from the government. Summers I would join them and snap cotton sun up to sun down, no running water and my first 12 -14 years of my life outhouses was what I knew. A law that stops anyone from voting when there is no need is hurtful. I remember the poll tax as I would walk with my father as he tried to convince people to pay the poll tax so they could vote. The law they passed is a poll tax. Why is a driver’s license so expensive? Want to get a birth certificate and you were born out of state, it is not easy. Want a passport, over $150.00, Texas ID too expensive. People don’t vote because the people we vote for normally don’t make a difference they don’t care about the problems that effect most people.. I don’t see much difference between when Richard’s was at the State house and when Perry was at the State house. I vote because it is my civic duty, not because I think that if a certain person is elected it will make much of a difference. My dad was a Democrat because of FDR and always voted for the Democrats. At that time the Democrats were the ones most likely to support education and equality. It is no longer true to the same extent. The partisan hat is not worn by me, I vote in the primary I believe my vote will make the most difference, here in Texas it is usually the Republican primary. Come November I am much more likely to vote for Democrats, some times I hold my nose and others like with Obama I just don’t vote for either candidate. So Bill until you have been poor or walked among them, don’t make assumptions. The flat out lying by the Republicans regarding the phantom voting fraud issue which could not be backed up by an any evidence is particularly galling and an obvious and nefarious attempt to create a bulwark against the present and future demographic shift in voting in our state. Any attempt to restrict voting is obscene. Your argument in defense of the law presented above is hole-filled and skewed, at best. Note: I am a Republican primary voter. Albeit, a science believing, round earth, pragmatic, common-sense minded Republican primary voter. then you’re the problem, brad m., not bill. at least he votes for the side he agrees with. First, thanks for sharing your story. Your grandparents sound like the salt of the earth people that built this country. And as far as not asking for welfare, that was common in their generation. My own grandparents would talk about those days, the days when being “on relief” was a badge of shame. Fast forward. Being “on relief” (read: welfare) is no longer shameful, but now actually celebrated. There are 47 million Americans on food stamps. That in itself is a shame, but what that tells us is, the poor must already have a state ID card (for the princely sum of $ 16, by the way) or a state driver’s license in order to collect those food stamps. Now, on the subject of poll tax, I do agree with you. I’m not interested in seeing anything that looks like a poll tax passed, but we have to be reasonable. 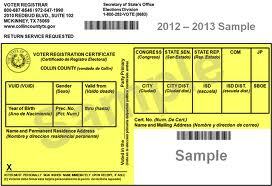 How many folks do not have a Texas DL or a Texas ID card? I can’t imagine that many people in these times have neither. But OK lets say they don’t. The voter id card was offered for free, and offices statewide issued them for the 200 or so folks who actually didn’t already have a DL or ID. Now, in order to get that free voter ID, yes, they did have to produce a birth certificate. This is where we get into minutia. If we want to go that route, then the act of getting to the polling place requires energy….either gas for the car, bus fare, or a Snickers bar to walk to the polls. Is that a poll tax? The time spent voting is time spent not working, so is our labor to vote a poll tax? How far back should we go to decide what is a poll tax? Is the cost of getting to the state office to pick up a copy of the birth certificate a poll tax? The three numbers that tell me this is really a non issue, and just something for the Pubs and Dems to bicker about are these: 47M on food stamps, 200 or so who actually got the free voter id card, and the less than 3% that voted in the San Antonio election. The voter ID law is fixing a problem that probably wasn’t much of an issue in the first place, and likewise, people who really want to vote not being able to comply with the new requirement doesn’t seem like much of an issue either. Assuming that Brad votes (D) in the general, but (R) in the primary, then I don’t see how his voting habits are a problem. It’s pretty obvious that Texas is firmly (R). He is being pragmatic if he votes for the least objectionable candidate proffered by the dominant party, knowing that party’s pick is most likely going to win the general. I myself am a Libertarian, so yeah, I’m just like the (D)’s when it comes to the statewide offices…..I already know up front my candidate is going to lose! I vote in the (R) primary, too, to vote for the least objectionable Pub, knowing that whatever Pub gets the nod will win the general. Brad is voting his conscience in the general, but being pragmatic enough to know a (D) isn’t going to win statewide for another few years, at least. People also don’t vote or skip races on the ballot due to gerrymandering and other laws thar enable Imperial Incumbencies. Bill if you were born out of state where to go to get a birth certificate? As far walking or traveling vote, in November the place to vote is usually within walking distance, I walk if I have voted early. I was born in another city in Texas, if I want to get a birth certificate I have to go downtown. But how do I know that I have to go downtown. I can go online, there are many people that do not have access to the internet. Do you know where downtown you have to go? Beside if they really wanted to prevent voter fraud they would prohibit voting by mail. No ID required to vote by mail. I can vote by mail because of my age. So why is it that Republicans don’t want to prevent voter fraud by mail? Think on that? I agree that the law probably does not make much of a difference, but it can on close elections. There was an election not long ago in Bellaire where one voted decided the outcome. Yvonne Larson you are actually right, if I reside in district that has been gerrymandered by the Republicans where the winner will be a Republican and I am a Democrat voting is futile so why waste time and money when I already know the outcome. Kinda like watching a game where you already know who wins.